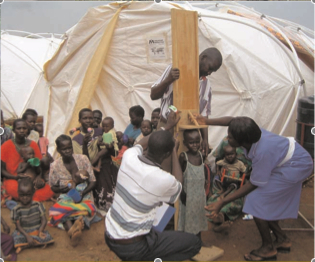 World Shelters offers durable, lightweight, low-cost shelters to meet the requirements of established humanitarian agencies. Our field teams, volunteers, and network of collaborators provide global delivery of temporary and transitional shelters. We support the work of agencies present in areas of need for relief operations as well as for transitional living. As a non-profit agency ourselves, we build relationships with shelter program managers for governments and NGO’s around the world. One of our strengths is working alongside international partners to provide culturally sensitive designs. Adequate shelter is a catalyst for a self-sustaining local economy. Shelter enables families to participate in the wider economy and community rather than just immediate struggle for survival. As costs for shelter decrease, resources are conserved for further recovery and development. World Shelters serves a pivotal role by providing temporary and transitional shelter in scenarios where current shelter is inadequate. Our shelters can enable the triage phase of relief projects to be as short as possible, to rapidly transition to permanence, recovery, and rebuilding. 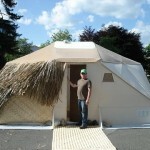 U-Dome: Hard wall, 200 square feet x 12ft tall dome roof on vertical walls, flame-retardant, weighs 125lbs, ships flat. TranShel: Hard panel, 18m2 footage, flame-retardant, very low price point. Quonset tents. Flame-retardant, simple assembly and disassembly. Designs can include locally sourced materials. *SPHERE is a collaboration of international agencies that sets standards for all emergency response materials. 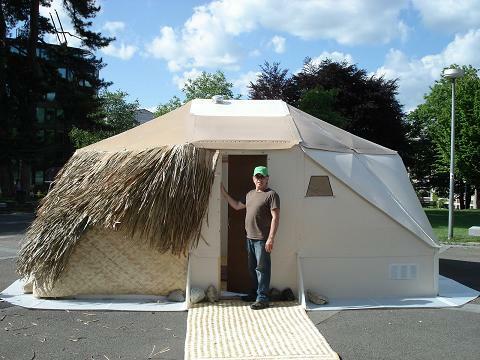 Our shelters are the lowest total cost to point of use SPHERE-compliant transitional shelters. We offer bulk financing tailored to your agency’s needs, including a disaster preparedness plan where you can have the shelters at the ready and only pay for them once they have been deployed.